Super busy at work last week -- sorry for being so absent. #1 burgundy cowl sweater, black pants and burgundy booties (sorta beatle-like, also in #2). #3 a definite grunge day - I loved wearing this, but realized in the pic that it's too much baggy all at once - it looks sloppy and adds weight. It would have been better with skinny jeans. But how's the length and size on the flannel? Is this one a keeper? #4-#5 Green light weight sweater with boyfriends. New-to-me strappy sandals (are they a bit more refined than the Dansko's I wore all summer?) and edgy belt. Does it work? As you know, I love suggestions for improvements! The burgundy is a wow! Love the green too. I do also like #3, but am not sure how you feel about being that boyish. #1 is great - I love the booties with that sweater. I also really like the green sweater on you. Where did you find the flannel shirt? I've been looking for a longer flannel button-down to wear with leggings and haven't found much. I know you arent feeling it so much but #3 is totally my favorite! Like you BFs, great with the green sweater. I love #3. I think swapping for slimmer jeans would make it sleeker but it looks boyish and cool the way you wore it. Burgundy cowl is so pretty on you. Love the booties :) Green is a great color on you. Nice faux tuck! Sara, the flannel is a Men's flannel, from a thrift store. It's a size up from my usual (the Men's medium fits me really well, this is a L), but I like the length of it as a jacket. Love #1 and #3 - wow, that green is really beautiful on you! The green outfit it lovely, and the burgundy looks great on you too! Those burgundy booties are gorgeous! And I love the green v-neck on you. Are the sandals Munro's? I think I've seen a style of theirs that looks similar to that. Very comfy! The burgundy booties are terrific. Love the bookending, too! Burgundy is one of your best colours, Amy. It's WOW. 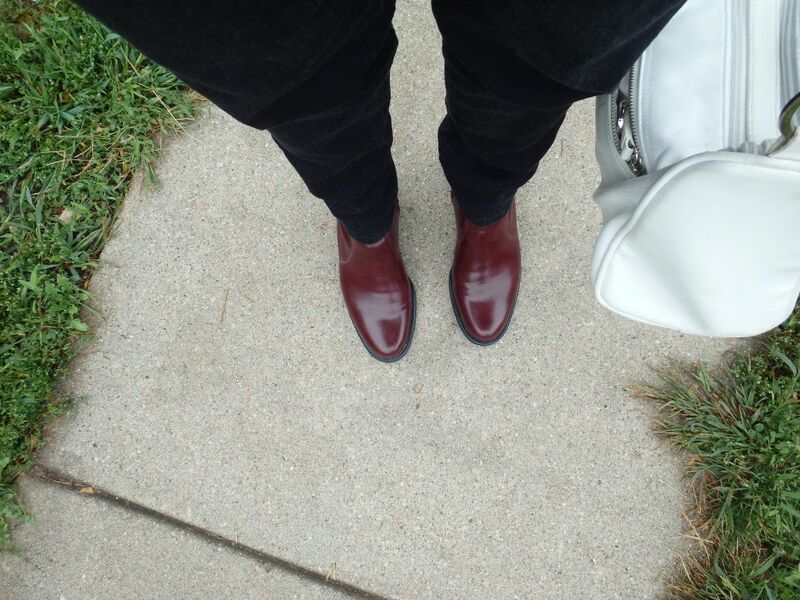 Great new burgundy booties. Love the burgundy booties especially. Try the flannel buttoned and semi-tucked - seems too long like this. Love the flannel very cute for home or even a run for errands. Shevia's suggestions sound good too. The green outfit is perfect! The burgundy boots are sweet as is the color of the cowl. Forgive me but I think I'd like the knit more in a finer gauge.